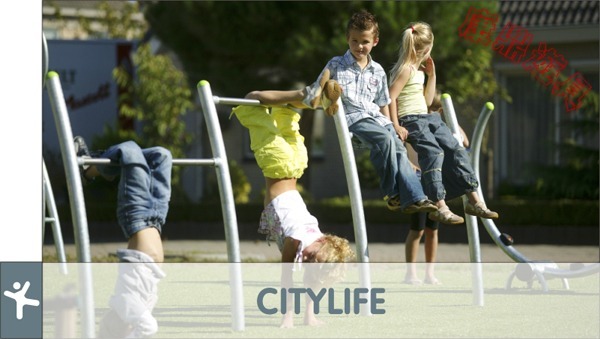 CITYLIFE is a unique product line designed for crowded urban areas. It's modern and robust, vandal resistant, made of stainless or galvanized steel, and fitted with anti-pinch clamps of cast nylon. Suitable for fun, exercise and hanging out, CITYLIFE is a perfect match with other KOMPAN products, such as GALAXY and BLOQX. The play equipment is designed to take up as little space as possible, practically maintenance-free, and contains classic play equipment such as swings, slides, seesaws, springers, bars and a play structure.